This is not a world that works for everyone. Screw whole bunches of that. 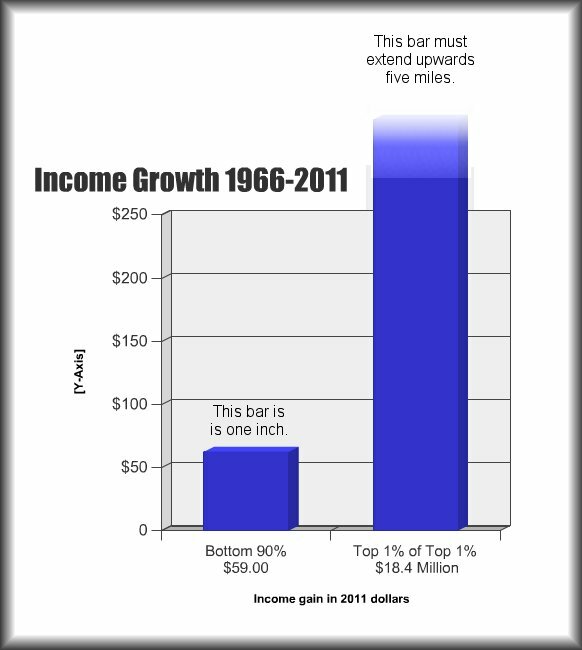 “In 2011 entry into the top 10 percent, where all the gains took place, required an adjusted gross income of at least $110,651. The top 1 percent started at $366,623. The top 1 percent enjoyed 81 percent of all the increased income since 2009. Just over half of the gains went to the top one-tenth of 1 percent, and 39 percent of the gains went to the top 1 percent of the top 1 percent. Ponder that last fact for a moment — the top 1 percent of the top 1 percent, those making at least $7.97 million in 2011, enjoyed 39 percent of all the income gains in America. In a nation of 158.4 million households, just 15,837 of them received 39 cents out of every dollar of increased income. That extreme concentration, however, is far from the most jaw-dropping figure that can be distilled from the new Saez-Piketty analysis. That requires a long-term comparison of those at or near the top with the bottom 90 percent. In 2011 the average AGI of the vast majority fell to $30,437 per taxpayer, its lowest level since 1966 when measured in 2011 dollars. The vast majority averaged a mere $59 more in 2011 than in 1966. For the top 10 percent, by the same measures, average income rose by $116,071 to $254,864, an increase of 84 percent over 1966. Plot those numbers on a chart, with one inch for $59, and the top 10 percent’s line would extend more than 163 feet. These numbers show without equivocation that the rich truly are getting richer at mind-boggling speed, while the rest of us are getting poorer by the year. It almost makes me want to support forced redistribution of wealth, but even these disgusting statistics can’t quite get me there. But somehow the playing field needs to be leveled, because inequalities of this nature in the land of the free and the home of the brave will not long endure without some sort of massive social upheaval down the road. I’m not an economist, so I don’t have the answers. I can only hope that there are people out there who still believe in a world that works for everyone, with no one left out, and who have the skills and insight to make a difference. For all of us. This entry was posted in Finance, Social Folly and tagged Economy. Bookmark the permalink. I still want the free market to figure this one out, but maybe the gummint can encourage it? Because although the poor will always be with us, we don’t have to make the distance between rich and poor as glaring as it was in the Middle Ages!